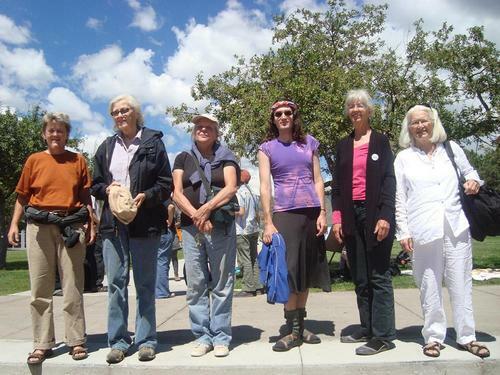 The Los Alamos Hiroshima Day Six (LANL6) were arrested together in the street in front of Los Alamos National Laboratory (see their testimonies) and were tried in the local Los Alamos Municipal Court on January 9th 2013. In the closing argument of the five-hour trial the Defense Attorney reminded the Municipal Judge that the job of every judge in every state according to Article VI of the US Constitution must uphold highest law of the land—international treaties (including the NPT of 1970 enjoining the US to abolish nuclear weaponry) and that the defendants on August 6th 2012 were merely performing their duties (according to the Nuremberg principles) as civilians who are confronted with crimes against humanity. The accused LANL6 may or may not comply with the penalties (including probation), and may or may not appeal for a trial De Novo. They are Summer, Wind, Cathie, Barbara, Pam & Janet. Before Judge Alan Kirk gave his verdict and penalties to each of the LANL6, the County’s Prosecuting Attorney and Defense Attorney each gave their closing arguments in front of the fully-packed courtroom (50 people plus the defendants, bailiffs and attorneys). The prosecuting attorney A.J. Salazar had based his argument that the LANL6 were guilty of trespassing on a commonly held belief that the land is LANL’s, and on alleged signage on the roadway indicating that alleged truth. No LANL/LANS/DoE representatives gave any testimony or were seen in the video (the main evidence for this case) REVOKING permission to be on-site, so no trespassing could have occurred, according to Defense Attorney Jeff Haas and the Judge’s logic and understanding of the law. That is why the LANL6 defendants were found NOT guilty on that single count. Although Haas reminded the judge that the goodness of the individual defendants and their reasons for doing what they did were as important as anything else in this court case, Judge Kirk nonetheless found the LANL6 GUILTY of the two other charges—refusing to obey the cops and obstruction of the a public roadway. Haas had read the statute regarding obstruction during his closing argument, pointing out that the language of the statute appears to be aimed at pedestrians being blocked by objects rather than drivers/cars being blocked by unarmed people, but that interpretation did NOT sway the judge. Being found guilty of the obstruction charge carried the weight of a $100 fine for each defendant, and the disobedience charge also carried the judge’s chosen penalty of $100. In addition, the defendants would have to pay court fees and probation fees for their upcoming probationary periods (probation is the other penalty each defendant faces). Haas had pointed out that the real national security threat is climate change which is ignored by LANL’s budget for the CMRR and other pro-nuclear weapons programs—that the imminent danger of climate change and nuclear terrorism conducted by LANL is of greater import than the possible municipal violations allegedly conducted by the defendants. The defendants notified the judge that they would pay no fines, and that might lead to jail time for both non-payment and in exchange for the dollar amount of the price tag (around $342 for each defendant including the probation and court fees). Earlier in the day, the video recording of the Hiroshima Day UnOccupy Los Alamos street-action used as evidence was played in court, and included the audio of the activists chanting “We are not a sacrifice zone,” and “This is sacred land,” and “We’re doing this for all living beings,” and “Respect we are on indigenous land.” The recording also showed cars being able to pass in both directions alongside of the alleged blockade of the LANL6. It also showed Police Chief Wayne Torpy refusing to accept a hug from Pancho, who was on a vow of silence on Hiroshima Day. The orchestration of the charges and courtroom setting has been conducted in such a way so that the defendants did not have a right to a jury trial. This is the first time in decades that the police and Department of Energy in Los Alamos have colluded in ensuring the lack of a jury trial for nuclear abolitionists arrested in the course of their duties as ordinary civilians encountering crimes against humanity. Hiroshima Day (August 6th) 2012 was a time for the Occupy Wall Street movement to attempt to UnOccupy Los Alamos National Laboratory (LANL). The radioactive legacy, the contributions to global climate change, the imperialistic charge, the wasting of Native American lands, and the power of the nuclear weapons development by the 1% are all unconscionable crimes in this region of New Mexico. To show public opposition to such criminal enterprises committed by LANL and its employees, dozens of civilians gathered in the town of Los Alamos and at LANL itself in August to play, pray and act up in favor of peace, cleanup of nuclear waste, sharing of resources, reparations to local Pueblos who have been harmed by LANL, and the end of US nuclear terrorism around the planet. Among the demonstrators, six refused to leave the semi-public street’s intersection leading towards LANL’s Technical Area 55 where the CMRR facility is being built. Those six were arrested and jailed for a few hours, AND their upcoming trial on January 9th will be of international interest due to the criminal activity of LANL itself and the alleged crimes of the LANL6. Each was sentenced to $200 in fines, $82 in court fees, one year of unsupervised probation and a $60 probation fee. The defendants, calling themselves the “LANL 6,” were Pam Gilcrest and Cathie Sullivan of Santa Fe; Benjamin “Summer” Abbott, Janet Greenwald and Barbara Grothus of Albuquerque; and Wind Euler of Tucson, Ariz.
Grothus is the daughter of the late Ed Grothus, who worked as a machinist at the weapons lab in the 1950s and ’60s, then left to run a surplus shop called The Black Hole and to lead anti-nuclear protests. The six sought a jury trial because they believed it would be an opportunity for more public attention for their cause. But their request was denied because the maximum jail sentence for their crimes was 179 days — one day less than the minimum 180 days that would have warranted a jury trial. So Kirk, a former Los Alamos police chief, ruled from the bench. An estimated 75 people attended Wednesday’s trial, even though only about 50 people were able to remain inside the courtroom at a time. Before Kirk sentenced the six, Jeff Haas, a Santa Fe lawyer who represented the defendants, said he told Kirk that some of them would refuse a fine and would go to jail, instead. But in his sentencing, Kirk levied the fines anyway. “We felt the penalty was harsh, and we’re trying to figure out how were going to respond to that,” Haas said. The bench trial lasted from 9 a.m. to about 1:45 p.m., with two breaks. “They all testified about why they went there and why the message they had was very important to them and why they thought the lab was destructive and a waste of resources, and the resources should go into dealing with climate change — not into fighting the imaginary Russian nuclear threat,” Haas said. About 100 people showed up at the Unitarian Universal Congregation in Santa Fe for a weekend fundraiser for the six defendants. Haas said nearly $3,000 was raised. The total fines and fees for the group amounts to $2,052. For decades, Los Alamos has been the scene of protests on the anniversary of Aug. 5, 1945, when the first atomic device was used in wartime on Hiroshima, Japan. Longtime demonstrators say the response to the annual protests has become more severe since Bechtel Corp. began managing the lab in 2005.